The number of drinks you can make with espresso is truly baffling. And as coffee lovers, chances are you can’t get enough of that rich, bold flavor. So why not give yourself the opportunity to brew it at home. 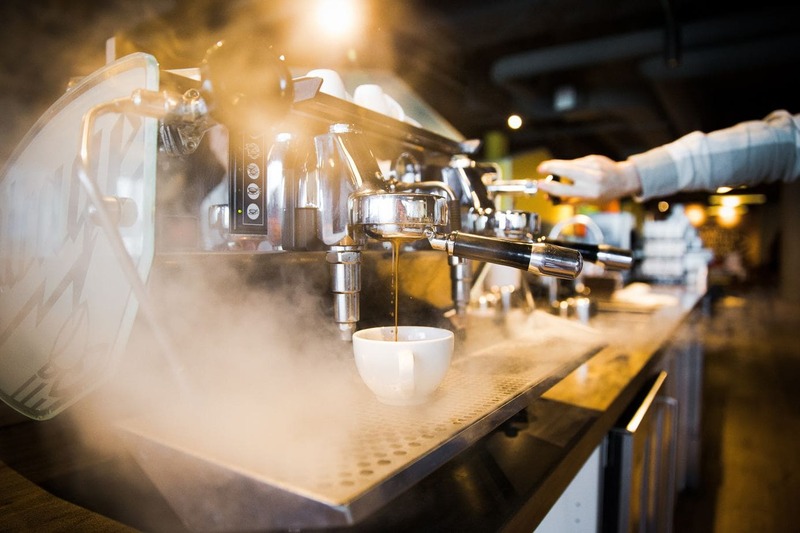 While getting an espresso machine can be pretty expensive, they usually pay for themselves if you’re an avid coffee drinker. Plus, they’re a bit more convenient than other brewing methods that yield similar results. If convenience is what you’re here for then you should probably be looking at fully or super-automatic machines. Though we usually recommend semi-autos for the optimal brewing experience, we understand that sometime you just want things to be easy. So below, we’ve put two of the leading espresso machine brands, Gaggia and Jura, so you can decide which one is worth your pretty penny. A classic, Italian company, Gaggia has been a leading name in the espresso machines since even before the company was officially founded. Achielle Gaggia is the man behind the curtain in the realm of the modern espresso machine. Gaggia patented the design for the steamless espresso machine in 1938 and created a machine that baristas could use to produce consistently delicious espresso. These machines produced what was called “crema naturale” and officially started the crema craze that remains an integral part of coffee culture today. Needless to say, the Gaggia company has continued to produce great espresso machines at a variety of price points for year. They offer everything from semi to super-automatic machines. Even after being purchased by the Saeco International group in 1999 and consequently Phillips (now Phillips Saeco), this company continued to pump out great products. They made the switch from aluminum to steel boilers and remain competitive with other top manufactures such as Breville. Jura Elektroapparate AP was founded by Leo Henzirohs in 1931. They are a high-end home appliance manufacturer, and their brand ambassador is Swiss tennis player Roger Federer. This Swiss company has been specializing in espresso machines since the 1980’s. Their machines have been so successful that they’ve begun phasing out their other products whose sales don’t even approach their espresso lines’. This success can be attributed to the fact that Jura exclusively produces high-end, fully and super automatic machines designed to last. These are some of the most durable machines available. Jura consistently refuses to compromise on quality, which is why they only produce pricier, top-notch machines. Unfortunately, that means if you have a lower budget, you might need to look elsewhere. Also, Jura doesn’t have any semi-automatic machines, which is a bummer for people who like a little more control with their brews. However, you will get professional quality espresso for years with a Jura. So if you are on the market for an automatic machine and have a good budget, one of their products might be right for you. The Anima Prestige is packs quite the punch in a surprisingly small footprint. This machine is sleek, compact, and easily programmable, setting it apart from a lot of it’s similarly priced competitors. This espresso machine also includes a built-in ceramic burr grinder with 5 grind options, similar to the Jura. The accompanying Optiaroma system gives you the option to brew between 6.5 and 11.5 grams (in 5 increments). Other programmable features include the temperature (177.5 °F- 184.5 °F), volume, and pre-infusion. You can even save your preferences for easy access later. Additionally, the Gaggia Anima Prestige features an innovative, removable group head, which makes regular maintenance and cleaning a breeze. 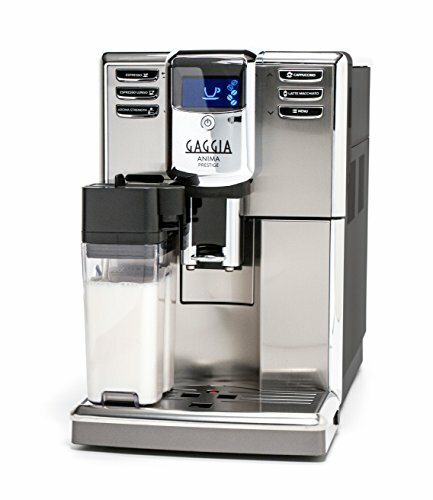 Like the Jura, this Gaggia also features a dual chamber milk frothing system. So you can count on reliably smooth, delicious diary elements in your espresso based beverages. Added bonuses include an auto-off and descaling feature, honestly there’s very little that didn’t get into the imagination of the design team on this one. Also, you can swap out the carafe for a water spout if you’re in the mood for tea (we won’t tell). Despite the impressive features, there are a few minor drawbacks to this machine. First, the water tank is slightly smaller than the Jura’s, which can be problematic if you drink a lot of Lungos or Americanos. The main complaint regarding this machine is the “meh”customer service experience. On the off chance that this machine malfunctions, you might not have the easiest time getting through the repair process. However, it’s not impossible, and the chances of getting a buggy machine in the first place are pretty low. The Jura Impressa C65 is a delightfully low-maintenance super-automatic espresso machine. The super-auto part means you can pretty much sit back and listen to your morning news podcast while this baby does the work for you. With Jura products comes Jura lingo. The ones you’ll have to know for this machine are Aroma+, IPBAS, and FFT. The first thing this machine has that you’ll notice is the Aroma+ technology, which is what sets it apart from the C60. This built-in grinder’s settings are displayed using coffee bean illustrations. This influences the fineness of your grind and the resulting strength of your brew. The Aroma+ feature is all but idiot-proof and makes operating the machine pretty easy. It also runs quietly and quickly. The next bit of jargon is IPBAS, which stands for Intelligent Pre-Brew Aroma System. This is simply a pre-infusion feature where your grounds are wet with a bit of water before the brewing actually begins. This improves the overall quality of shot-pulling. Lastly, the Impress C65 has FFT, or Fine Foam Technology. This just means your milk is twice-frothed in two different containers before being deposited into your drink. This ensure you get top-notch, creamy microfoam. Out main complaint with this machine is that it isn’t quite as customizable as other machines at this price point. And adding those features by upgrading to a different model can mean tacking on several hundred more dollars to the price tag. At the end of the day, you’re going to get more bang for your buck with a Gaggia machine. However, if you’re more concerned about durability than anything else, opt for the Jura. 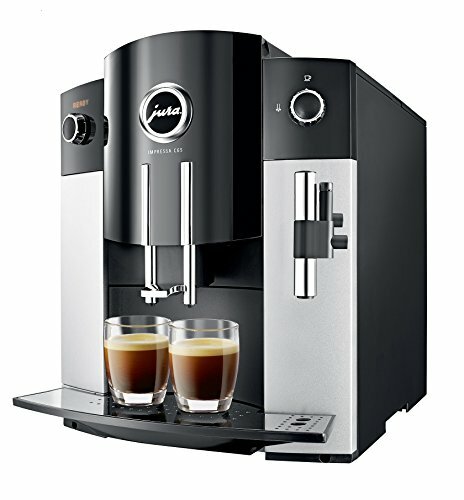 Also, if you are considering a semi-automatic espresso machine, Gaggia has a few good options whereas Jura only produces automatics.